Iron brooch. Wrought iron T shaped bow brooch with possibly thickened or decorated ends to its wings, possibly one of the Colchester derivative family. The bow has an apparently angular section, though this is almost certainly the result of the fractured loss of corrosion products. 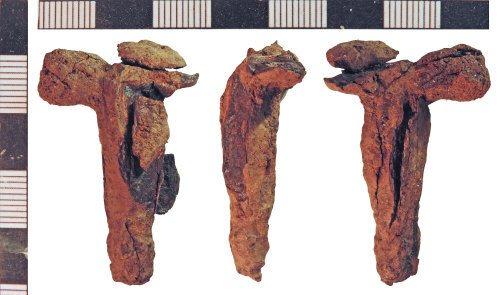 Three detached fragments of rust in the bag indicate the process of deterioration has continued apace since the discovery of the brooch. Suggested date: Early Roman, 50-125.